The team behind the world’s first Switch Projector is back again, this time with a Bluetooth Speaker that works with the Nintendo Switch. It plugs and play with the Switch and can connect to other devices via Bluetooth or 3.5mm Auxilary cable. 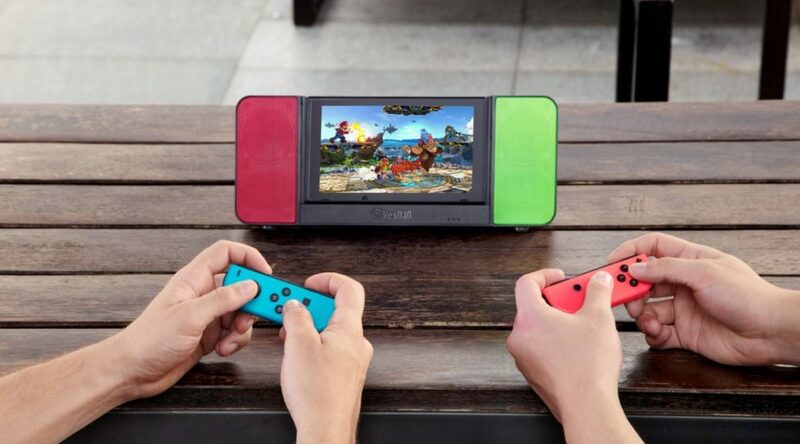 Being more than just a portable speaker that can connect with the Switch, the speaker also has an HDMI-Out port meaning that it can function as an alternative to the Switch’s dock as well. You should definitely check out their cool product at their kickstarter here. There are too many new speaker docks popping out in the market. While they’re actuallyall the same, even though they look much different from outside. Today I stumbled upon this pretty speaker dock that just so happens to be extremely dope and Nintendo fans are going to kill for it. Meet the YesOJO Bluetooth Speaker here. It’s made from high quality materials, and holds the Nintendo Switch in place as it plays to amplify the sound and make some real noise in the game party with your friends. Plus, the YesOJO Bluetooth Speaker is pretty gorgeous in variable color combos . Its industrial design is in perfect harmony with the dynamic design of Nintendo Switch, and contains so much fun inside. YesOJO is the creators of the Switch projector dock that unveiled and launched in theyear before year. Last year, they have unveiled their latest creation in the form of the Nintendo Switch speaker dock which has been designed to be used with a Switch games console in tabletop mode. At the beginning of this year,the speaker is going to launch a crowdfunding campaign. As well as being equipped with speakers, the YesOJO speaker dock also offers users a cooling system to help keep your Switch console at lower temperatures during those longer gaming sessions. Whether it’s at home or on the go, there are numerous cool ways to enjoy the Nintendo Switch. The system’s tabletop mode is a nice way to replicate the home experience while on the road, but those looking for a similar aural experience have, thus far, been out of luck. Fortunately, peripheral maker YesOJO’s latest innovation should give Switch owners a nice audio boost when they play on the go… while also giving the system’s battery a boost, as well! The company’s new speaker peripheral, which they’ve dubbed the “World’s First Bluetooth Speaker for Nintendo Switch,” works exclusively in tabletop mode, granting the system “rich audio quality with a deep, resounding bass.” The add-on is expected to get 8-12 hours of battery life per charge. However, charging the peripheral with the system plugged in will also charge the Switch unit, making it even more enticing for those that might just have one charger. So far, YesOJO has announced two colors for the unit, both based on different Joy-Con duos. Finally, the speaker will also support additional devices via Bluetooth, as well.